A few years ago I took stuff for my groups at McCalls to make cards for Easter. They really loved it and I asked back in Novemeber if they wanted to make some Christmas cards. Everyone of them seemed excited about the prospect of being able to give someone a card they had made themselves. I knew I would have to do card kits as we only have an hour for group and I have 6 in each group. I also scheduled two hours for group that week so we would have plenty of time to get the cards done. I think their favorite thing to do was to use the Cuttlebug and they used it on all 3 of the cards each of them made. I had one lady quickly become an expert and she helped the others get the "sandwich" right for embossing the paper. It was truly a wonderful thing having her be able to help so I could help the others get adhesive on the other pieces. Even all the guys liked using the Cuttlebug. I had the stamps picked out for the sentiments and I showed them how to do the stamping on the cards. 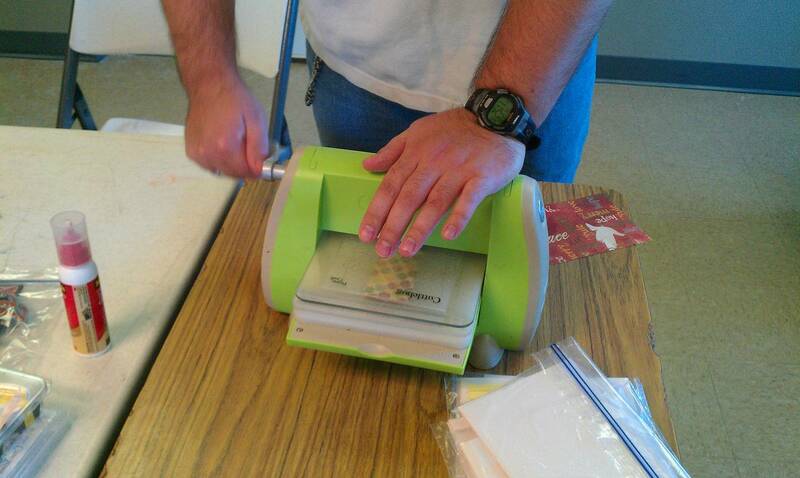 I did allow them to do their own stamping after I showed them. I had some extra pieces with me in case anyone messed up. I am terrible about dropping my stamp on my paper sometimes and messing it up so I wanted to be prepared. They did a wonderful job and not one of them dropped the stamp...showoff's! These were the first two cards they made. They used the Swiss Dots folder on the pink square behind the snowflake. 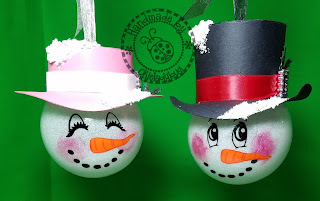 The snowflake was also Cuttlebug but I did those in advance to save on time. 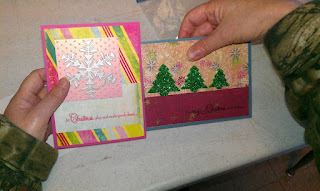 On the background behind the glitter trees the piece was embossed using the Snowflake embossing folder. The trees were some foam stickers I have had for quite a while and never used. They really liked those. The last card we made took a little more time. 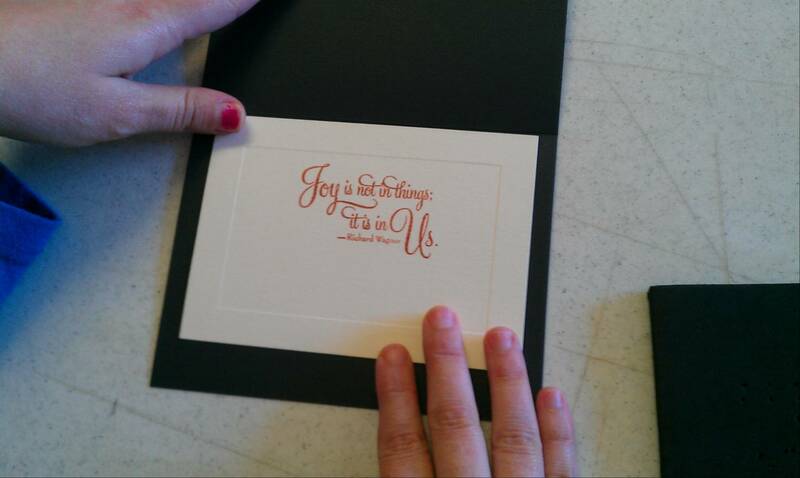 I did add the Liquid Pearls to the word "Joy" beforehand because it would have taken too long to dry and I didn't want anyone being disappointed with a smears on their cards. This card was the favorite of all. I think it was the color combination they really liked. I know they embossed the paper on these but I can't remember what they used but I am thinking Dvine Swirls and Swiss Dots. They were eager to let me take pictures of their cards and while they were making them and were a little disappointed when I told them I couldn't photograph their faces for confidentiality reasons and one even said "I'll sign one of those papers if you want to take a picture of my face". The paper they were talking about is the release of confidential information *okie laughs thinking about how smart these folks are and how many people in the open community just don't give them a chance*. They are all excited now because I told them that since they did such a wonderful job we could do some cards for Valentine's day. They also want to do some birthday cards so they can have them on hand and we will probably do those more closer to summer time. They all worked so well together and helped each other out. I know a lot of folks would probably say this activity was not therapeutic but I would disagree. 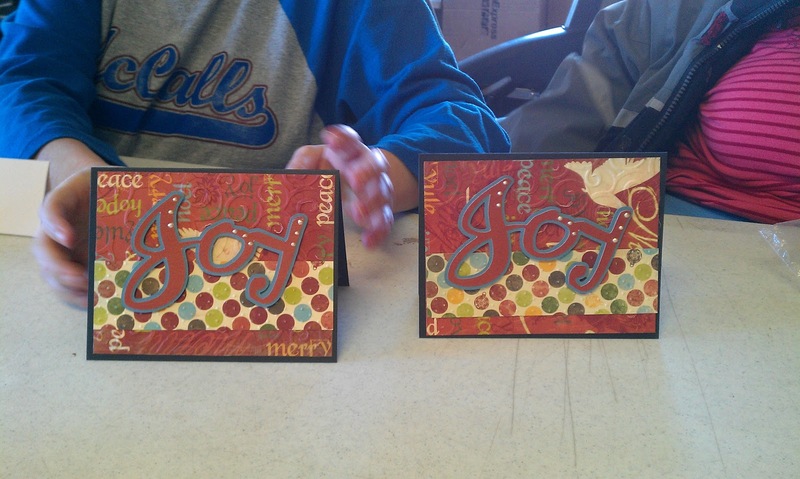 Each individual worked on skills of following instructions, helping others, self-esteem, coping with frustration and discussed how by giving the cards to people in their support group will help them show appreciation. I try to be as creative with my therapy methods as I am with my crafting. It keeps my clients from getting bored and if it is something fun they are more likely to use the skills in the future. I think this was fabulous of you to take your time to do this. It took a lot more work than just the hours spent there with them getting everything ready. I would agree that making cards can be VERY therapeutic for all the reasons you mentioned and then some. They did a great job with all the cards! 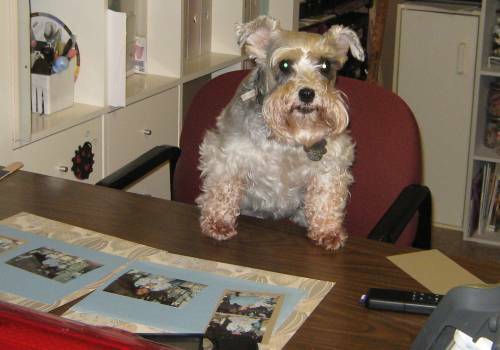 Shirley ~ This is such a great community service project. You have such an awesome heart. The card is so cute. I love how the sentiment inside ties in soe nicely to the "JOY" on the outside. What a wonderful project and you can tell you care about your students. I love the cards they are adorable. Thanks for sharing this heart warming story with us. What an excellent project...you are a blessing to those folks! Who could say that card making isn't therapeutic? Don't most of us use our crafting as therapy? I think it is a great project and so nice of you to take the time to make up the kits. Such a wonderful idea and what a lovely way to share your talent. TFS and a Very Happy New Year. I would disagree with anyone that says this project is not therapeutic. It does teach all that you said. A big plus is that it's FUN. So good of you to come up with this therapy. What a totally awesome therapy sessions! And I completely agree with how therapeutic this is. I often go to children centers, youth groups and senior centers to do the same thing ... they love it so much, and I think I get as much out of it as they do. One of my favorite parts is that, at least for this short crafting session, they all come together to laugh, have fun, and support and encourge one another. It's also great to hear the stories of how they plan to use their cards. Besides being fun, it's also a heart warming experience. They not only benefitted, but you did as well!! I can't wait to see their valentine cards. Sharing your card making with others benefits you too! Can't wait to we the valentines project! How sweet and special you are Shirley! I love when you do this and then let us see on your blog!! I so agree with you about it being so therapeutic and don't know why others don't see it. I know I did similar things with my "at risk" students at school with reading. We would read a book, like an Ice Cream book, once they mastered the reading I would buy the things to make the ice cream. They would ready the book to their class and serve the ice cream to their class. These kids just blossomed and where so proud of themself as I was too! Yep it a good thing!!! God Bless you Shirley!! What a wonderful and inspirational post! I think it is very special of you to do this and I am so glad you shared with us. 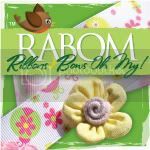 You have inspired me to checking in to donating my time and supplies (tons of supplies, lol) to do something similar with kids and/or maybe at a senior assisted living facility! Thanks so much for sharing!